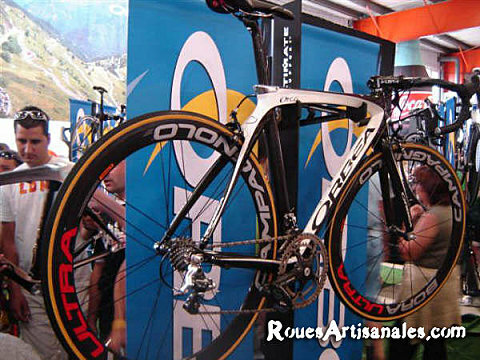 The new Orbea Orca that will be available the next year has got smoother but also bulkier lines than the current model. It should be stiffer as well. Foromtb.com was nice to share with us the picture. Zipp will use dimpled new hubs for its next wheel line. Phonak and CSC top riders already sometimes use them in good conditions. Zipp claims these new hubs save 3 Watts over the current hubs when the wind is at 0 to 15°. Zero Gravity crankset we’re all waiting so much is announced available earl in 2007. After many months to be developped and tested under every conditions, this part with a very special geometry will finally reach the production lines. We already wrote something about this crankset a few months ago (see here) will use a custom Zero Gravity bottom bracket spinning on Phil Wood bearings.